Sri Lanka's opposition leader and former president, Mahinda Rajapaksa said on Saturday the country should not co-sponsor a UN Human Rights Council resolution currently being tabled in Geneva. "The government has announced that they will co-sponsor yet another resolution brought against Sri Lanka in the UN Human Rights Council," Rajapaksa said in a statement. "Resolution 30/1, the first such co-sponsored resolution in October 2015 committed the government to among other things, setting up a hybrid war crimes court with the participation of foreign judges, prosecutors and investigators and to removing by administrative means, individuals in the armed forces suspected of human rights violations even if there is insufficient evidence to charge them in courts." "By co-sponsoring Resolution 30/1, the Sri Lankan government officially accepted Report No: 30/61 dated 28 September 2015 prepared by the Office of the High Commissioner on Human Rights (OHCHR), which directly accused the Sri Lankan armed forces of many crimes including torture, enforced disappearances, deliberate targeting of civilians and the denial of humanitarian assistance to civilians," he added. His comments come as the Office of the UN High Commissioner for Human Rights (OHCHR) said in its report that "virtually no progress" had been made on war crimes investigations as detailed in the original resolution 30/1, which called for a hybrid court with international judges to investigate war crimes. In candid statement published this month the Sri Lankan foreign affairs ministry said it would co-sponsor a roll-over resolution but admitted it would be doing so as "this strategy will prevent international war crimes allegations being continuously leveled against Sri Lankans through strengthened ownership of the implementation process." The ministry's remarks were swiftly refuted by the president however, who has sent a 5 member delegation to Geneva in order to seek a withdrawal from the resolution process. 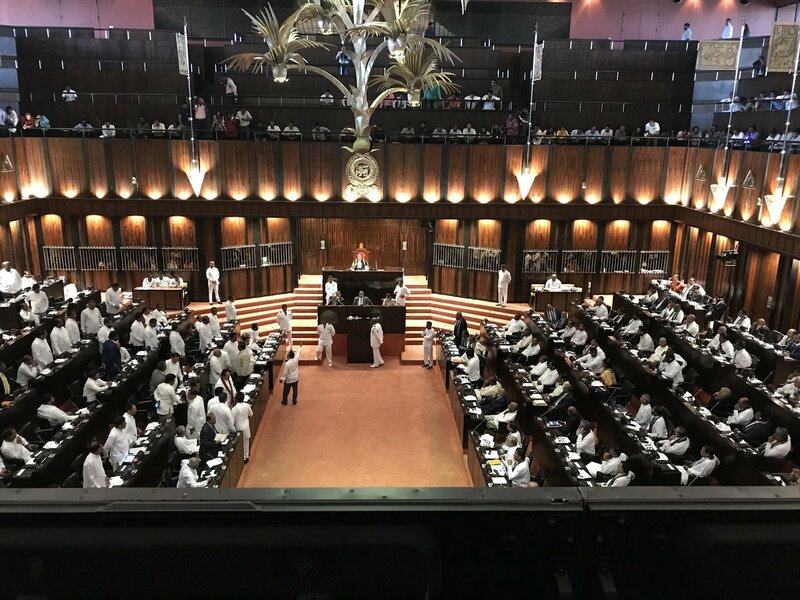 Sri Lanka's Leader of the House, Minister Lakshman Kiriella reassured parliament this month that foreign judges would not hear cases within a war crimes inquiry. Stressing that no 'war heroes' would be put before foreign judges, Kiriella said, “we were pushed towards involving international experts in a probe on the war because of the mistakes made by the previous government such as moving towards impeaching former Chief Justice Shirani Bandaranaike and arresting former Army Commander Sarath Fonseka." “The advice sought from the international experts will be confined to technical assistance. No foreign expert will be allowed to hear the case,” Kiriella added. The Sri Lankan government's sincerity in implementation has been widely questioned by Tamil organisations and human rights groups worldwide, as well as the former UN High Commissioner for Human Rights, Navi Pillay, who have condemned the lack of meaningful progress on key concerns. Pointing to Colombo's attempt to further delay the implementation of the co-sponsored UN Resolution 30/1 by talking of a 'truth and reconciliation commission' just days before the UN Human Rights Council was due to convene and review the resolution, Pillay said, “the key promises of justice and accountability are missing in the Prime Minister’s message." "I am disappointed to learn that on the eve of the interactive dialogue on the Office of the United Nations High Commissioner for Human Rights’(OHCHR) report on Sri Lanka in the UN Human Rights Council, the Government of Sri Lanka is resorting to yet another delaying tactic to escape......implementation of Resolution 30/1,” said Pillay.